A few weeks ago in a post entitled “Seeing With a Different Eye“, I posted some photos taken with a lens called the Lensbaby, a lens that blurs much of the image, leaving a small portion in focus. Those two images were basically static subjects giving me the time to compose with this lens slowly and carefully. 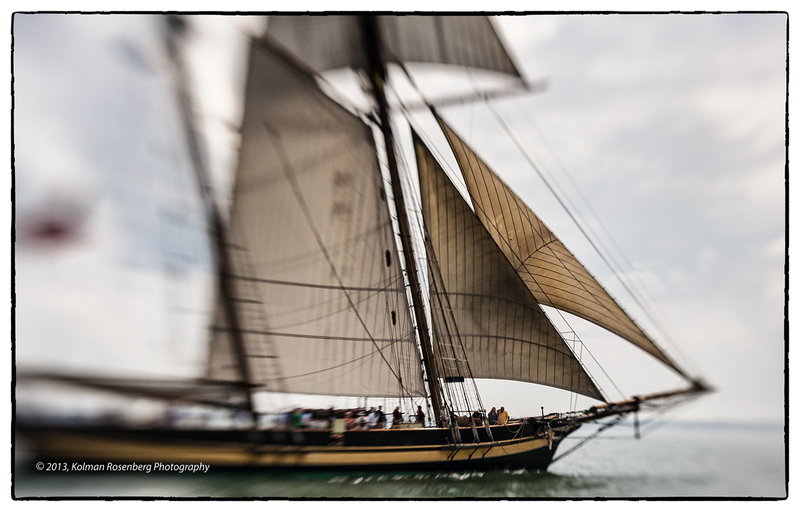 During the Tall Ship Festival in Cleveland several weeks ago now, I shot with 2 cameras, one with a normal zoom lens and the other with the Lensbaby again. This presented a new challenge, shooting moving ships from another moving boat! No time this time to compose but having to compose and shoot on the move! This first shot, The Big Tow, was taken on the Cuyahoga River prior to leaving the dock. The tug was towing a large ore carrier backwards, outbound toward the lake. In this case I wasn’t actually moving too much and the tug and ship were moving slowly. Challenging, but time for a little bit of selective focusing variation prior to hitting the shutter. This second shot however was very challenging. In this case, I was on a boat moving in one direction while the tall ship, Pride of Baltimore, was moving in the other. My intent was to get the bowsprit and bow of the Pride of Baltimore in focus while the midship and stern were out of focus. I came close, the bowsprit extended out into the out of focus portion as did the stern. I like the look of it however, it reminds me of a ship moving out of a dream and them perhaps back into the dream. What do you think of the Lensbaby look? I’d appreciate your feedback. 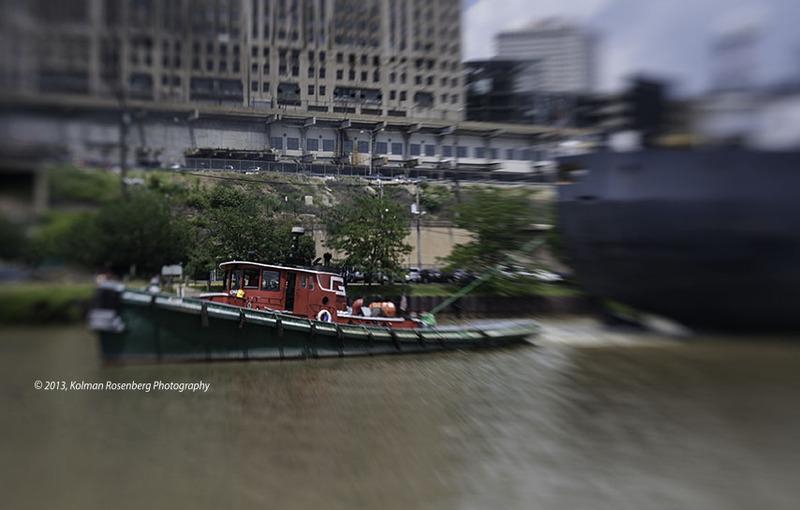 This entry was posted in Uncategorized and tagged Cuyahoga River, fine art, focus, Lensbaby, pride of baltimore, selective. Bookmark the permalink. Are we still on for Aug 4th? Marilyn’s Got fashion 2013. We are Michael! Send me more details when you have them. You know how I feel about your Lensbaby photos! I tried shooting with a regular lens (24-70) and almost forgot how to use it! You are doing a great job with the Lensbaby, Kolman. I hope you continue to get a kick out of its possibilities. Thanks Nancy! I don’t think it will become my main shooting lens, but it won’t be set on the shelf either! I enjoy using the Lensbaby, it’s results and I enjoy the challenge! I’ve got to start working with the Edge 80 now too and see what I can do with that! I appreciate your encouragement and coaching!